Johanson Microwave Tuning Elements are specially designed devices for tuning microwave circuits such as filters, oscillators, delay lines, multiplexers and dielectric resonant structures. 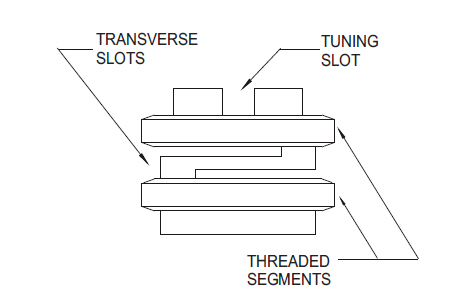 Generally speaking, Johanson Tuning Elements consist of a mounting bushing with an integral tuning rotor. Adjustment of the rotor changes the capacitive loading between the ground plane and the active regions of the circuit. Operating in the microwave through millimeter wave band, the Johanson Microwave Tuning elements are available in three basic material options: metallic, dielectric and resistive. The primary advantage of Johanson Microwave Tuning Elements over standard screws and nuts is the drastic reduction of technician tuning time, lower associated tuning losses and increased tuning resolution. In addition the proper use of Johanson Microwave Tuning Elements permits the relaxation of costly circuit mechanical tolerances. Specifications defining the exact parameters of devices, such as step recovery diodes, varactors, transistors and dielectric resonant materials may also be broadened with the resultant benefit of increased cost effectiveness. Prior to the introduction of Johanson Microwave Tuning Elements, the microwave circuit designer was burdened with the frustrating task of selecting from a makeshift conglomeration of “Hardware Store” nuts and bolts to tune precision microwave circuitry.